This uncommon 1784 map of the world on a Mercator projection by Robert de Vaugondy occupies the ephemeral period between Captain Cook's second and third voyages. Cooks explorations along the eastern coast of Australia as well as around New Caledonia and are in evidence while his later work in the Pacific, including his important exploration of American northwestern coastline, is noticeably absent. Instead the northwest coast of America is loosely ghosted in with minor inland notations regarding the fictional discoveries of Admiral de Fonte. Barthlomew de Fonte was supposedly a Spanish Admiral who, sailing up the Pacific coast c. 1640 discovered a series of gigantic lakes, seas, and rivers heading eastward towards the Hudson Bay. Upon one of these great inland lakes he met with a ship from Boston that claimed to have come through a Northwestern Passage. De Fonte's story appeared in a short lived 1706 English publication entitled 'Memoirs of the Curious.' The story inspired no less than Joseph-Nicholas de L'Isle, younger brother of the better known Guilleme de L'Isle. Joseph-Nicholas was at the time employed by the Russian Tzar Peter the Great in the compilation of Russian surveys and discoveries in Siberia and the extreme northeast of Asia. When he published his somewhat accurate map of northeast Asia, he paradoxically decided to include on the same page an entirely speculative map of North America based largely on De Fonte's letter. De L'Isle's mantle was later taken up by Jefferys, another ardent supporter of the Northwest Passage theory, who incuded De Fonte's discoveries in his own map of the region, which was, ultimately, the inspiration for this map by Vaugondy. Elsewhere on this map Tasmania or Van Dimenians land is erroneously attached to the Australian mainland. Similarly, between Korea and Kamtschatka, Hokkaido, Japan's northernmost island, is attached to Sakhalin – a common error of the period. This map typically appears in one of three color schemes designed to illustrated either world religious, skin tone, or race. This particular example is colorized to emphasize the predominance of various skin tones in different parts of the world. Whites (les Blancos) are represented by green, brown skin (les Bruns) are identified by red, yellow skin (les Juanatres) by yellow, and olive skin (les Olivatres) by light green. 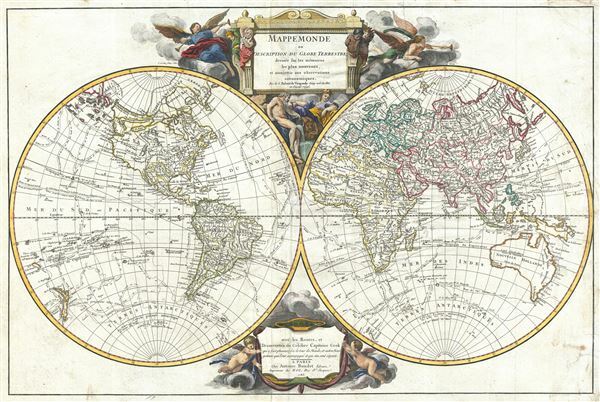 Published by Robert de Vaugondy in the 1784 eidition of his Nouvel Atlas Portatif. Vaugondy, R., Nouvel Atlas Portatif, 1784. Very good. Minor mat-burn. Old framing tape on verso. Pedley, Mary Sponberg. Bel et Utile: The Work of the Robert de Vaugondy Family of Mapmakers. 15.